Sean Kelly is delighted to announce that Antony Gormley's latest site-specific permanent public installation, Chord, will be on view at the Massachusetts Institute of Technology in Building 2—which houses the Department of Mathematics and sections of the Department of Chemistry—as of Saturday, April 23. 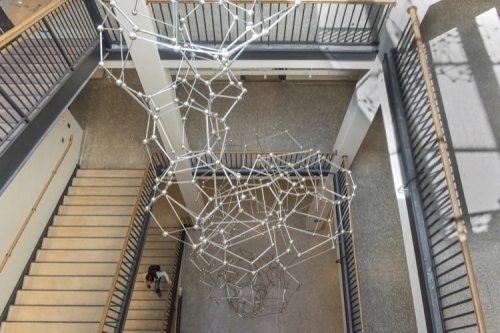 A 40-foot-high spiral column made from a myriad of polyhedra, the work connects the floor of the building’s central staircase to the skylight. In contrast to the fixity of the classical column or Brancusi's Endless Column, which make a solid bridge between above and below, Chord evokes a dynamic relationship between matter and energy in connecting earth to sky. The work was commissioned through MIT’s Percent-For-Art Program which is administered by the MIT List Visual Arts Center. For more information, please visit listart.mit.edu.